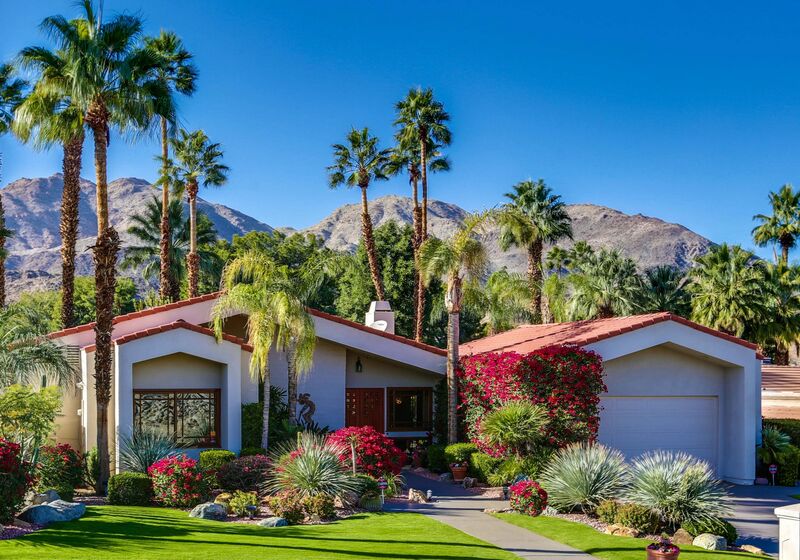 Trendvision’s® most recent year-over-year, March 2019 vs. March 2018 Report shows (-6.7%) fewer homes sold last month and inventory remains low throughout the Palm Springs area. The number of homes sold was down (-10.8%) in the under $500K price bracket, essentially flat in the $500-$999,999 price range, and up a healthy (+15.7%) for homes selling for over $1M. Inventory constraints eased slightly in the $500-$999,999 price range with a slight (+2.0%) increase in homes available for sale. Inventory for the under $500K price range was nearly unchanged, and there were (-5.7%) fewer homes available for sale priced $1M+. Average selling prices rose (+9.0%) for homes priced under $500K, and sale prices rose (+9.6%) for homes priced $1M+. Selling prices remained flat for homes in the $500-$999,999 price range. Interest rates are still very attractive and remain well below 5%, which is helping the market. You can get a 30-year fixed rate mortgage at 4.375% and the FHA 30-year fixed rate is 4.125%. If you’re financing a larger amount, the Jumbo 30-year fixed rates are 4.25% and adjustable Jumbo loans can be had for as low as 3.75%. 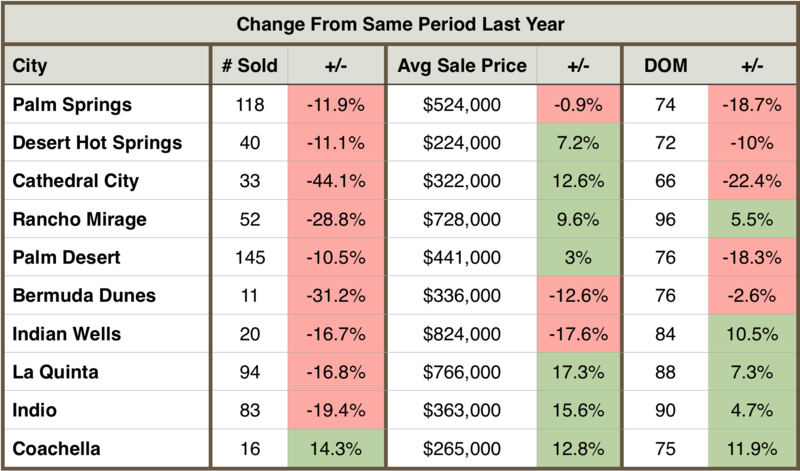 Average Home Sold Prices rose overall in the Palm Springs area by (+13.2%) over the same month last year. The biggest gains were for homes priced under $500K (+9.0%) and homes priced $1M+ selling for (+9.7%) more. Number of Days on Market dropped (-2.3%) compared to March of last year, with the biggest change in the $1M+ price range where Days on Market dropped (-8.1%) over last year. Homes in the other price bands were selling quicker than a year ago as well, with Days on Market down (-6.2%) for homes priced $500,000-$999,999 and down (-2.5%) for homes priced under $500,000. The Number of Homes for Sale. The number of homes for sale peaked in February at 3,850, with a slight decline last month to 3,742. Well keep an eye on this number next month, as we may have started our typical seasonal decline in available inventory. Inventory last month was down down slightly (-0.8%) over March of last year. I’ve stated this for the last 5 months, and it’s still true today … current trends have us in a seller’s market in most areas, with homes selling quickly and desirable homes priced right receiving multiple offers. Continuing our trend over the last five months, the Number of Homes Sold in March 2019 vs. March 2018 was down across the Palm Springs area. The biggest percentage drop in sales were found in Bermuda Dunes down (-52.2%), Cathedral City down (-21.3%) and La Quinta down (-19.1%). Sales remained essential flat in Coachella while Indian Wells and Indio saw sales increased (+11.8%) and (+7.8%) respectively. 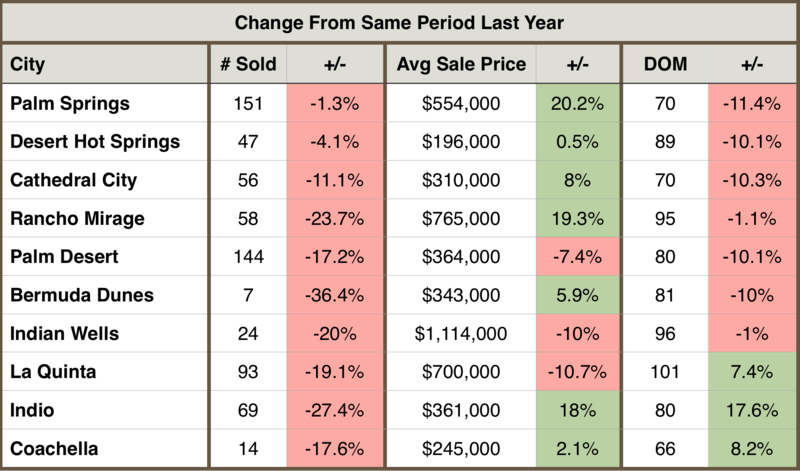 Most cities experienced a rise in average selling prices, with the exceptions being Rancho Mirage, down (-17.4%), La Quinta, down (-10.7%), and Coachella, down (-6.7%). The Number of Days on Market was down in all cities, with the exception of Indio, up (+20.3%) and Coachella up (+100%). April is a month full of music in the greater Palm Springs area! You’ll enjoy a variety of music this month ... the jazz & blues featured in the Garden Jam Music Festival in Indian Wells, Palm Springs’ annual Opera in the Park, and of course the two major events ... Coachella and Stagecoach. 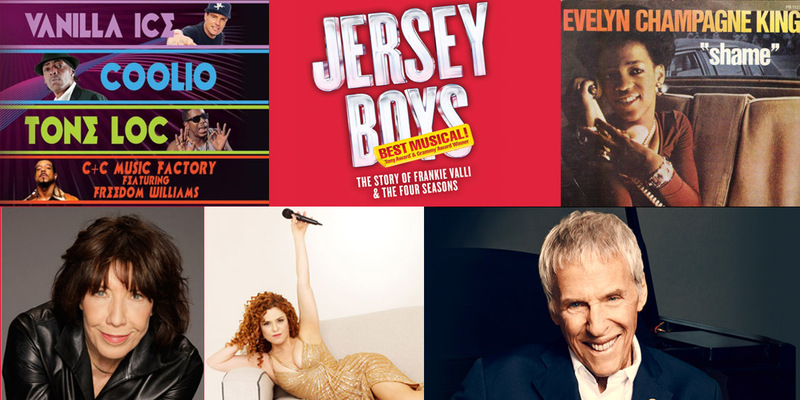 So whatever your musical tastes - from rock to opera, there is something for everyone this month! With the BNP Paribas tennis tournament over for another year, music takes over the Indian Wells Tennis Garden. Featuring some amazing blues and jazz, the tickets are affordable and the venue is perfect. This year’s event features Jimmie Vaughan, Los Lobos, Buddy Guy, and Bradley Cooper’s backing band from A Star Is Born ... Lukas Nelson & Promise of the Real. And the Lifestyle Village will offer gourmet food, cocktails and wine, and fine & shopping. Opera in the Park is the premier cultural event in April in Palm Springs. This annual FREE concert of beloved opera arias will feature accomplished opera professionals and will be accompanied by a professional orchestra conducted by Valery Ryvkin. Bring a picnic lunch or make a reservation at the Café d’Opera, and enjoy a relaxing afternoon of opera at Sunrise Park. The Coachella Music Festival turns 20 this year. Named the best outdoor music festival in North America twelve times by Pollstar, this year’s festival features headliners Tame Impala, Ariana Grande and Childish Gambino, as well as several unique art installations across the festival grounds. Tickets are sold out, but you can still get on the waitlist for both weekends. Country music fans flock to the Polo Grounds this month to see live sets by Luke Bryan, Sam Hunt and Jason Aldean. With a variety of restaurants to choose from, including Guy Fieri’s Stagecoach Smokehouse, and on-site amping available, it’s sure to be a wild weekend of country music. 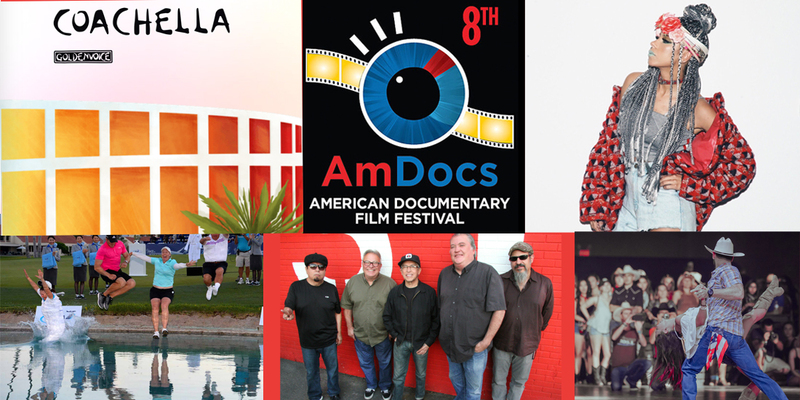 The 8th annual American Documentary Film Festival (AmDocs) comes to Palm Springs and showcases films that tell real stories behind the real issues. Named one of the world's five coolest Documentary Film Festivals by MovieMaker magazine, AMDOCS has a fast-growing reputation for featuring a superb program of films that engage, inspire and entertain its audience. This year’s festival will screen over 150 films across three venues: the Palm Springs Cultural Center (Camelot Theatres), the Helene Galen Theatre in Rancho Mirage, and the Indian Wells Theater and Oliphant Auditorium. Click HERE for a full list of films and ticket information. Here’s your chance to watch the best women golfers in the world at the first major golf tournament of the year … the ANA Inspiration held at Mission Hills Country Club. This year is the 48th year for the tournament to be hosted at Mission Hills … the first tournament was held in 1972 and hosted by Dinah Shore. So come out and watch the play, stop by the autograph tent to meet your favorite players, and relax at the ANA Experience exhibit. Players are competing for a $2 million prize and that classic jump into Poppie’s Pond. Not to be outdone by Palm Desert, it’s time for Palm Springs to host their fashion week, with three days of fashion, music & beauty, and a special live music performance by Jaira Burns. This year’s event takes place at the Riviera Hotel and features a fabulous 100-foot runway built over the Chiki Pool at the hotel. The show tends to be a bit edgier than Fashion Week El Paseo, and features one of my favorite Project Runway designers, Candice Cuoco. There’s nothing like watching a classic movie poolside on a warm desert evening! So head over to the Arrive Hotel on April 26 at 7pm to check out the Mel Brooks classic Blazing Saddles. And it’s totally FREE! If you’re looking for live theater, don’t miss the two newest productions at the Palm Canyon Theater. Grand Hotel, inspired by Vicki Baum's period novel, tackles issues of life and death, financial ruin, love and murder, as people and come and go through the lobby of the Grand Hotel. And The Diary of Anne Frank is the true story of a young Jewish girl who kept a diary of her time hiding from the Nazis during World War II. 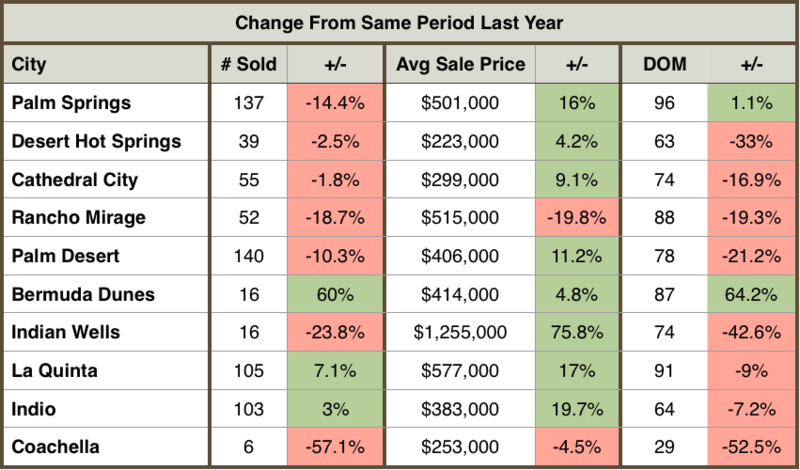 Homes are Selling Faster … And Selling Prices Are Up! World class tennis returns to the Indian Wells Tennis Gardens, with the BNP Paribas Open featuring most of the 75 top-ranked tennis players in the world. The tournament, which drew over 450,000 fans to the area last year, has earned the nickname “the fifth slam” and remains a favorite of tennis fans due to the fantastic weather and the state-of-the-art tennis facilities at the Tennis Gardens. Expect to see Raphael Nadal, Roger Federer, Venus & Serena Williams, Novak Djokovic among the top players at this year’s event. Click HERE for BNP Paribas Open information and tickets. If you’re an art lover … you’re in for a treat with two superb weekend art festivals coming to the area. The La Quinta Arts Festival will be held on the La Quinta Civic Center Campus and the sprawling outdoor gallery has been called “the most stunning festival site in the country”. That’s high praise for a festival that includes over 200 artists displaying unique works of art in every medium and price point. The vent caters to “novice enthusiasts” as well as “sophisticated collectors” and the multi-day pass and free parking make this festival a great value. 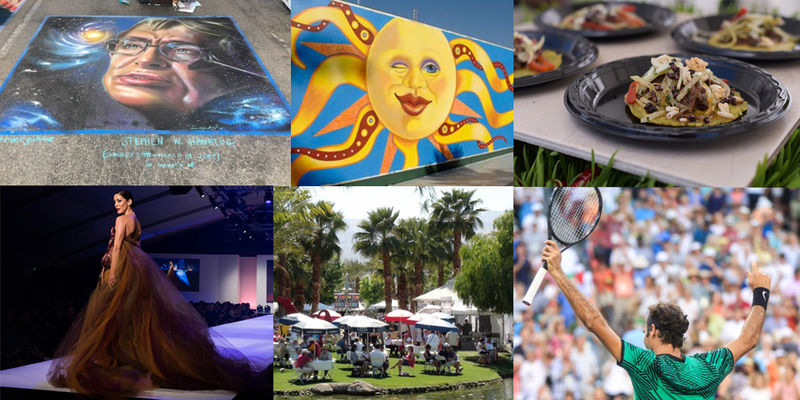 The 17th Annual Indian Wells Art Festival takes place as the Indian Wells Tennis Garden is transformed into a festive artist’s village and outdoor marketplace. You’ll explore thousands of one-of-a-kind pieces of art amid live entertainment, cocktails, and a wide selection of food. Ranked as one of the 100 Best Fine Art Shows in the country, this year’s festival brings featured artist Leslee Adams — also known as The Watercolor Chef for her bold watercolors of food, landscapes & florals — to the desert. Produced by Palm Springs Life magazine, this 3-day event brings many of the most prominent chefs, vintners, and brewmasters to the renowned El Paseo shopping district in Palm Desert. You’ll enjoy food from more than 30 local and celebrity chefs and over 40 local restaurants, complemented by an array of 60 amazing wines. Kick off the weekend with a James Beard gourmet 4-course luncheon, and enjoy a weekend of cooking demonstrations, food tastings, and wine & liquor tastings. 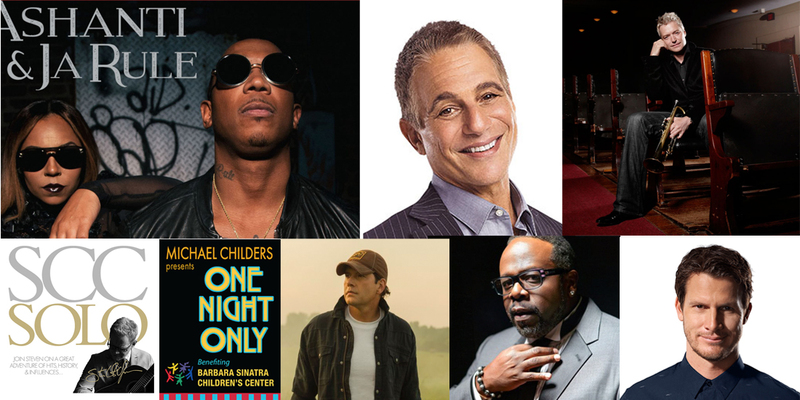 Click HERE for a complete schedule of events and to purchase tickets. It’s time for some of the best designers to present their collections on the “Rodeo Drive of the Desert” as we prepare for El Paseo Fashion Week 2019. Enjoy fabulous runway shows, fashion demonstrations, including some of the best designers from the TV show Project Runway, and a closing night runway show by New York designer Lela Rose. If you see something you like on the runway, hit up the trunk shows with the designers the day after and be the first to own the latest designs. 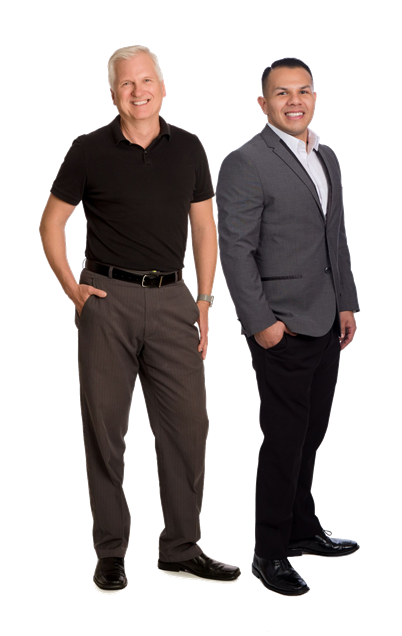 For a schedule of events, and to buy tickets click HERE. Feel like a kid again … with chalk art! Stop by the 9th Annual Palm Springs Chalk Art Festival and experience top professional and student artists creating amazing creative works on the sidewalks outside the Palm Springs Art Museum. There will be hands-on activities, live music and more … and the event raises over $20,000 to benefit arts education in Palm Springs. The Palm Springs area’s newest live theater venue — Coachella Valley Repertory Playhouse — opens this month in Cathedral City with a production of the musical CHESS. With music by ABBA’s Björn Ulvaeus and Benny Andersson and lyrics by Tim Rice, this Broadway musical is the perfect way to open this new venue. The theatre is housed in the former IMAX Theater space and the newly renovated space seats 208 theater lovers for each show. It’s A Trend … Sales Are Down While Prices Are Up! 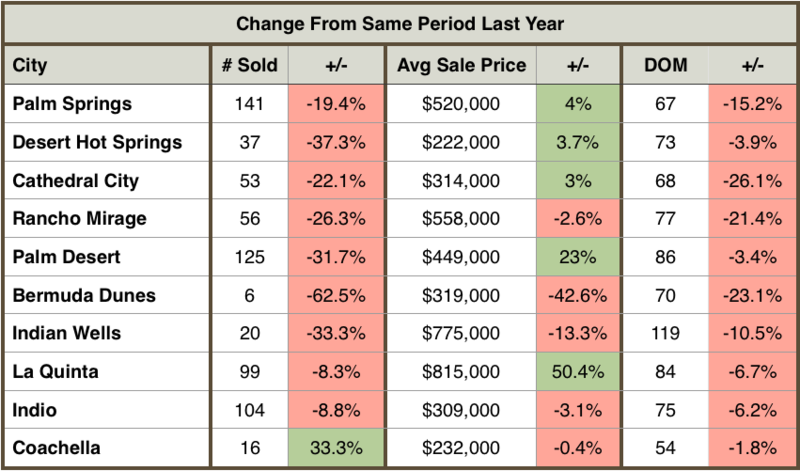 If three months in a row makes a trend, we have a clear new trend in our local housing market. The number of homes sold fell for the third month in a row in the Palm Springs area, and inventory is now at a 10-year low. While there are fewer homes on the market, buyer activity remains strong and that’s driving home prices up. Available inventory is down (-7.3%) over the same month a year ago, with 298 fewer homes available for sale. With fewer homes available for sale, we’re seeing a slowdown in actual home sales, with the number of homes sold down (-17.2%) over the prior January. As a result, the average selling price rose (+5.7%) to $504,000 and the average selling price per square foot rose (+7.4%) to $247. Homes continue to sell quickly, with Days on Market down (-11.4%) to 78 days. Trendvision’s® most recent year-over-year, January 2019 vs. January 2018 Report shows fewer homes sold in all price bands, with the biggest drop in the under $500,000 price band, with a (-19.0%) drop in number of homes sold. Home sales in the $500,000-$999,999 price point dropped again this month, with (-12.9%) fewer homes selling, while the $1M+ price band saw sales fall off by (-10.2%). Average selling prices rose in all price categories, with the largest percentage increase in the under $500,000 category, with a (+4.5%) increase in average selling price. The $1M+ and $500,000-$999,999 price bands saw smaller gains, with average selling prices rising by (+2.9%) and (+0.6%) respectively. Average Home Sold Prices rose overall in the Palm Springs area by (+5.7%) over the same month last year. The biggest gains were at the low end and the high end of the market, with sale prices of homes priced $500,000-$999,999 remaining essentially flat. Interestingly, after relatively slow growth in home pricing over the last few years, appreciation of attached homes (condos) has outpaced detached homes (single family homes) over the last few months. Number of Days on Market dropped (-6.9%) compared to January of last year, with the biggest change in the $1M+ price range where Days on Market rose (+51.2%) over last year. Homes in the other price bands were selling quicker than a year ago with Days on Market down (-15.8%) for homes priced $500,000-$999,999 and down (-9.4%) for homes priced under $500,000. The Number of Homes for Sale. While we are seeing the typical seasonal uptick in new listings, our inventory is still below what is normal for this time of year. Inventory is down (-7.3%) over January of last year and strong buyer activity combined with inventory shortages will likely drive an ongoing shortage of desirable housing in the are for the foreseeable future. For the third month in a row, the Number of Homes Sold in January 2019 vs. January 2018 was down across the Palm Springs area. Once again, the number of homes sold was down all cities except for Coachella, which saw a (+14.3%) increase in home sales. The largest percentage drop in home sales was in Cathedral City, down (-44.1%), Bermuda Dunes down (-31.2%), and Rancho Mirage down (-28.8%). 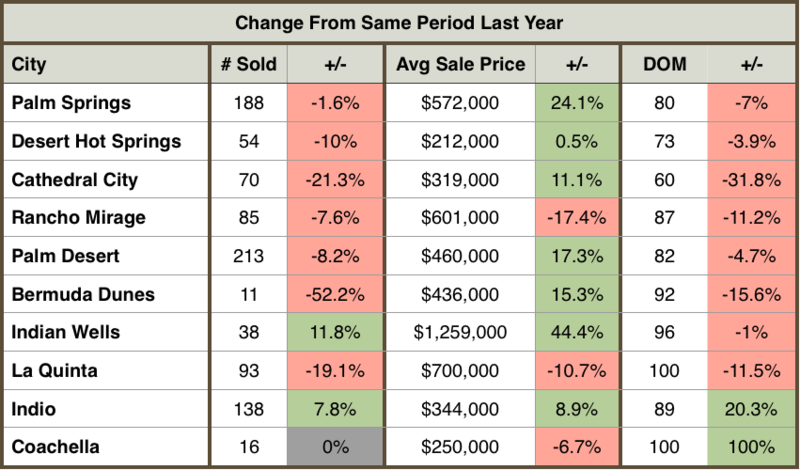 When looking at Average Selling Price, most cities experienced a rise in average selling prices, with the exceptions being Indian Wells, down (-17.6%), Bermuda Dunes, down (-12.6%), and Palm Springs, down (-0.9%). As we move into February, our desert hosts some of the most popular events of the season. 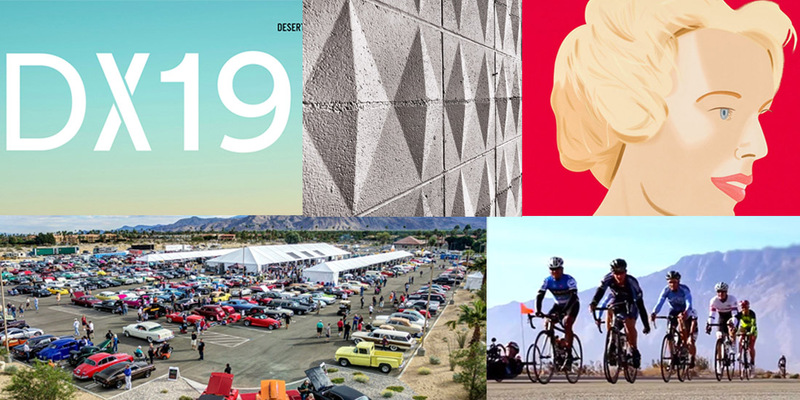 Desert X returns after a years absence, and the Tour de Palm Springs, Modernism Week, and McCormicks’ Classic Car Auction make their annual return. 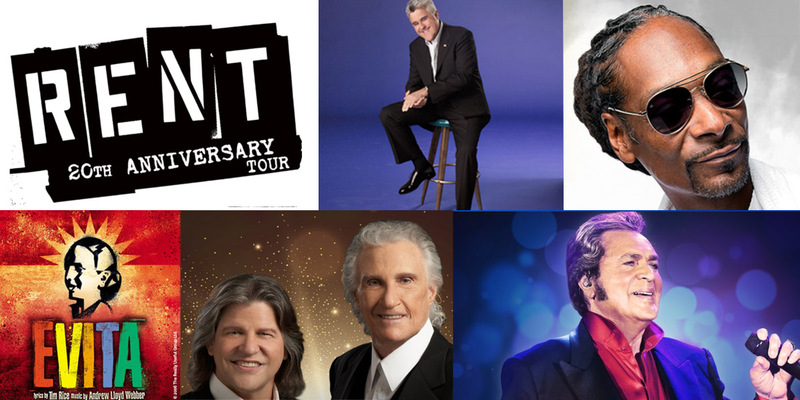 And with live shows by Snoop Dogg, Marie Osmond, Jay Leno, Pitbull, & The Lettermen, and more, there's something for everybody to enjoy! 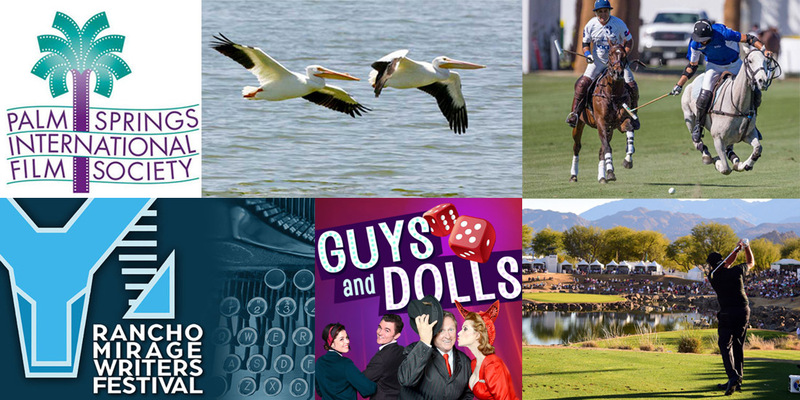 So scroll down and check out all of the fabulous February activities in the Palm Springs area! Building off the success of the initial exhibition in 2017, Desert X returns to the Palm Springs area with unique art installations on display throughout the Coachella Valley. Desert X integrates our natural landscape into the artists' works and aims to engage audiences interested in art and the environment. Details on the artists' projects and where to find them will be officially released on February 9. Click HERE for more information on Desert X. Calling all biking enthusiasts! It’s not too late to get in on the action! Registration is still open for the annual Tour de Palm Springs. There are four rides available for every experience level … from a short 9-mile ride to a more grueling 102-mile ride … there’s something for everyone. Proceeds from the event benefit nearly 100 local charities and you won’t find a better way to get in some exercise with fellow bikers while helping raise money to benefit the community. And if the bike ride isn’t your thing, you can always come out to cheer on the riders. Click HERE for more information on bike routes and to buy tickets. 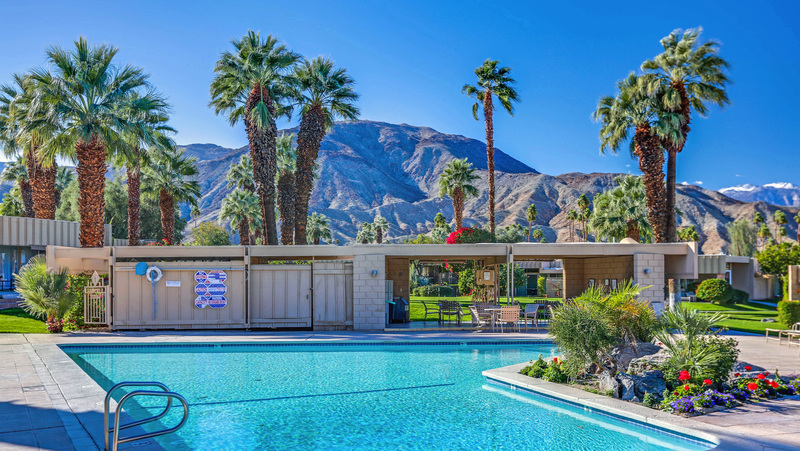 One of the area’s premier events — Palm Springs Modernism Week — returns to the desert for 10 days this month, with over 350 events celebrating mid-century modern design, architecture, art & fashion. The event kicks off with the Modernism Show & Sale at the convention center, where you’ll find a variety of quality mid-mod furnishings and accessories available for sale. The ever-popular double-decker bus tour is back, as are the Signature Home Tours, walking neighborhood tours, and a variety of lectures and educational events. You won’t want to miss the walking tour of Sandpiper Palm Desert on Feb 21, so get online and get your tickets now. Click HERE for a schedule of events and to purchase tickets. Who doesn’t like a county fair? For 73 years, locals have found the Riverside County Fair & Date Festival to be one of the best entertainment values in the area. Enjoy musical concerts headlined by country star Randy Houser, hip hop legends Salt-n-Pepa, and the ever-funky Kool & the Gang. And don’t miss some events you can only find at a county fair — bull riding, monster truck competitions, Demolition Derby, and Mini-Dwarfs Racing. (If you don’t know what that is, click HERE). The fair is a bargain, with tickets selling for only $11. For more information on the fair, and to buy tickets click HERE. If you’re looking for that special piece of artwork for your home, you won’t want to miss Art Palm Springs at the Palm Springs Convention Center. You’ll join over 15,000 art lovers as they appreciate post-war and contemporary art from galleries in Asia, Europe, North and South America representing hundreds of artists from around the world. The event, which kicks off with an Opening Night VIP reception, has been a draw for curators, collectors, designers and celebrities who appreciate the quality of the art presented. Click HERE for more information on Art Palm Springs. When we reflect on our local real estate market, it’s been a fantastic year for sellers, with strong buyer activity resulting in homes selling faster and at higher prices than the year prior. And while inventory is low, buyer’s are still finding fantastic homes at prices that make them a really good value. Our business has been strong this year — our team successfully closed 37 transactions in 2018 for nearly $16M in sales — and we are looking forward to another busy year in 2019. We appreciate the trust our sellers and buyers have put in us, and to everyone who has referred business to us last year, we say a big “Thank You”! As more people discover the beauty and active lifestyle of our many desert communities, our communities become more vibrant. Whatever your interests, you’re sure to find plenty to do as we move into the new year. 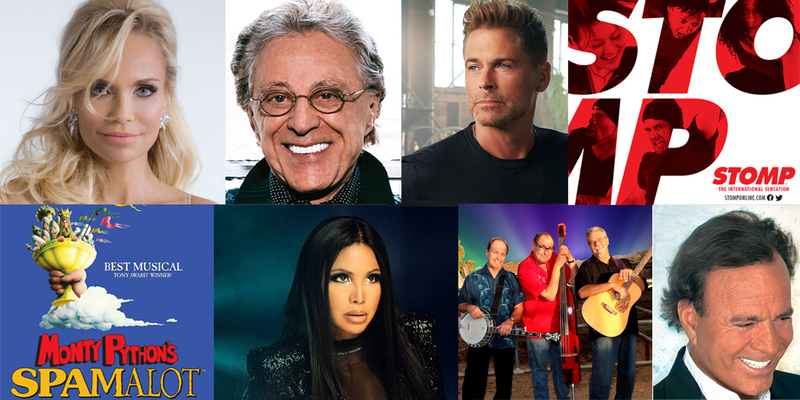 January kicks off our high season with a variety of quality shows, concerts and sporting events ... we wish everyone all the best in the coming year! Palm Springs kicks the season into high gear each year with their internationally acclaimed film festival, and the 30th year of the film festival promises to be it’s best ever! Showcasing over 200 films from 60 different countries, there’s something for everyone! And don’t miss the awards gala where award recipients, Spike Lee, Glen Close, Olivia Colman, Bradley Cooper, Rami Malek and others will grace the stage. Click HERE for the Film Festival event calendar and tickets. It’s back! There’s nothing like a relaxing afternoon watching some the world’s best polo players at the Empire Polo Club on a Sunday afternoon. You can bring own food and beverage and tailgate, or opt for the VIP experience — for only $30 per ticket - which includes a reserved seat in the shade and available food and beverage service. Click HERE for more information on the Empire Polo Club and to buy tickets. The Desert Classic golf tournament — formerly known as the Career Builder — returns to the desert this month. Featuring play by some of the world’s best on the PGA West’s Stadium & Jack Nicklaus Tournament Resort Courses, and the La Quinta Country Club, this year’s event includes classic rock from Sammy Hagar on Jan 18 and Bad Company on Jan 18. Click HERE for more information and to purchase tickets to the tournament. Bird watching enthusiasts make note! The annual Salton Sea Bird Festival takes place this month and it’s your chance to observe many of the over 400 species of birds that make the Salton Sea their permanent or winter home! Birding is available by land or kayak. Kick off the new year with the first big dog show of the season. Featuring more than 170 AKC-recognized breeds, judging starts at 8am, admission is $10, and parking is free. Held at the Empire Polo Grounds. For more information on the dog show click HERE. Often described as “Coachella for the Brain”, the Rancho Mirage Writers Festival brings over 50 authors to the Rancho Mirage Library for 3 days of talks and story telling by a wide range of authors, including well known names Governor Jerry Brown, Sally Field, Susan Eisenhower, Maureen Dowd & Tom Hanks. The event is currently sold out, but you go online to join the waitlist. Click HERE for more information and to join the waitlist. Set in Depression-era Times Square, Guys and Dolls is about a couple of big city gamblers and the women who love them. Catch this classic musical at the Palm Canyon Theatre. For tickets to Guys and Dolls click HERE. December is often the slowest month for home sales in the Palm Springs area, and we experienced the typical slight downturn in sales that comes as many of our buyers turn their focus to family for the holidays. Inventory constraints showed improvement for the third month in a row, with the number of homes available for sale (-8.6%) below November of last year … much lower than the (-25.0%) we had seen over the summer. The number of homes sold is down slightly (-9.1%), not unexpected for this time of year, while average selling prices rose nearly (+11.5%).